Ft Welikit was great for us. Here's another vote for RafterJ. They have several sections and the sites are mostly spread out but still have full hookups. They are getting pretty pricey but again, spacious and full hookups. It's an easy drive to all the sites and activities in the Hills. We spend a week there every August (after the Sturgis rally). I am not a fan of bigger is better. My preference is Horse Thief Campground. I like a more natural site. All I need is a place to dump my tanks every 5 or 6 days. Electricity not required for us. We really liked Rafter J. Big CG, pancake breakfast was good, proximity to Rushmore can't be beat. Nice pool, showers, laundry. This place does not disappoint. For those that don’t know. There are 2 Horse Thief’s. On is a Forest service campground and the other is a private RV campground. 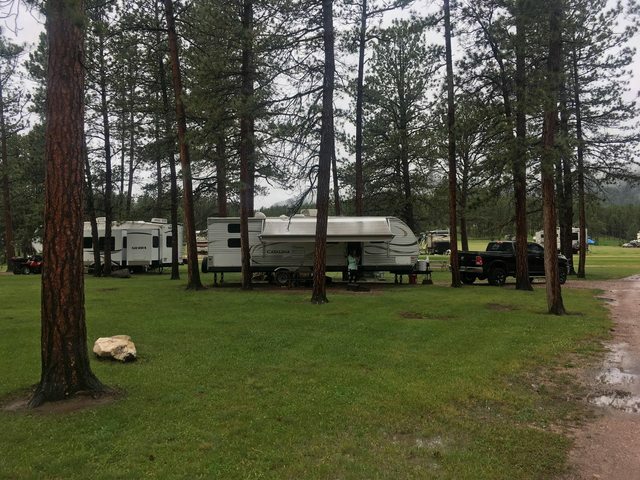 We stayed at Legion Lake Campground in Custer SP and loved it!! Very convenient to the monument and other things to do in the area. Sorry double post. Thought the picture attached on the first one. Trying again. A photo of our spot in Rafter J this past summer. We visited several other campgrounds in the area for future trips and realized Rafter J was perfect for us. No regrets not choosing another campground.